FSX – Legacy Radios Updates. 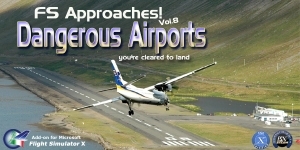 This update package brings more legacy radios and updates to your existing FSX avionics. Updates for existing packages are for; my RNAVs mostly, to allow for Robbie’s “Logger” to remember the single waypoint data for the King KN-74, the Narco CLC-60 (if applied) and included is my latest RNAV, the King KNC-610. All these updates have a “Localizer Protection” added so the RNAV basically stays off-line when you dial in a localizer frequency into Nav 2. An experimental ID-824 Narco VOR head is in this package if you’re looking for something different to look at for Nav #2. A basic VOR and an RNAV version is within the “Narco_Gauges” folder. This is an introductory pacakage of the “Logger” application, which will follow my King KNS-81 RNAV, wherein has ten waypoint memories in it, for obvious reasons, Logger was selected. All XML files, as in past packages, can be installed manually, or with recomended editors like FS Panel Studio software for “better fits” to existing panels. This entry was posted on June 9, 2018 at 15:34, and is filed under Panels. Follow any responses to this post through RSS 2.0.You can leave a response or trackback from your own site.